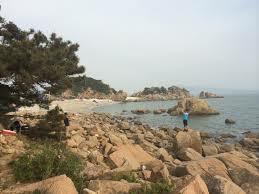 Yeongjongdo Island (영종도) is located 2.5 km northwest of Wolmido Island (월미도), Incheon. Because there are many swallows on the island, it used to be called Jayeondo Island as well. Because it is connected now by Yeongjong Bridge to the mainland, it no longer has the proper atmosphere of an island, but since the building of Incheon International Airport, many tourists have been coming here to visit. At the center of the island is Mt. Bakeunsan, and there are highways circling around it. Baekun Mountain is famous for its Yonggungsa temple, where Regent is said to have lived for 10 years, and its mineral mountain water spring. In front of Yonggungsa temple, there is a 1,300 old zelkova tree, adding to the ancient atmosphere of the place. If you walk up to the top of Baekunsan Mountain, you can see Incheon International Airport and its surrounding area. The area has Yeongjong Sky Park and Mt.Baekunsan Gliding Range, so you can enjoy some exciting sports here. At Yeongjong Sky Park, you can learn basic flight skills with light planes, so even beginners can experience flying planes here. The bathhouse near the seashore uses hot spring water, and so the water is very good here. It can accommodate up to 3,000 people and is a great place to relax after a hard day of traveling.